In the fall Mr. Griffey returns to Houston Grand Opera for Alfred in Johann Strauss’ delightful operetta Die Fledermaus. The cast includes Liam Bonner as Gabriel Eisenstein, Wendy Bryn Harmer as Rosalinde, Laura Claycomb as Adele, Susan Graham as Prince Orlovsky and Samuel Schultz as Dr. Falke. Performances will be on October 25 and 27, November 2, 8 and 10. “And in the work’s most intensely and ravishingly beautiful movement, the Agnus Dei, the only word that suffices to describe the effect of Anthony Dean Griffey’s inspired singing is “sublime.” There was, too, in his sheer relish of the text, a clarity and insight akin to the verbal acuity that Peter Pears, and in our own time Ian Bostridge, have lavished on it. In 1998, Anthony Dean Griffey’s career was jump-started with a single performance of Peter Grimesat the Met. This month, he returns to the company to take on Grimes again – this time, in a brand-new Met production of Britten’s masterpiece, directed by John Doyle. The tenor talks to DAVID SHENGOLD. 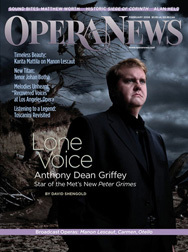 “The American tenor Anthony Dean Griffey brings an unusual combination of vocal qualities to his artistry. Though in its color and character, his voice is a light lyric tenor, he sings with a power associated with heftier tenor voices. What matters most to him, though, is communicating. Surely that’s why he decided to sing an entire program in English for his New York recital debut at Zankel Hall on Saturday night. Among the many impressive qualities Mr. Griffey displayed on this important night, his clear and natural diction offered a model to his American colleagues of how to sing in English.